“If you want to do political art, do first a political thing.” Agree or Disagree? 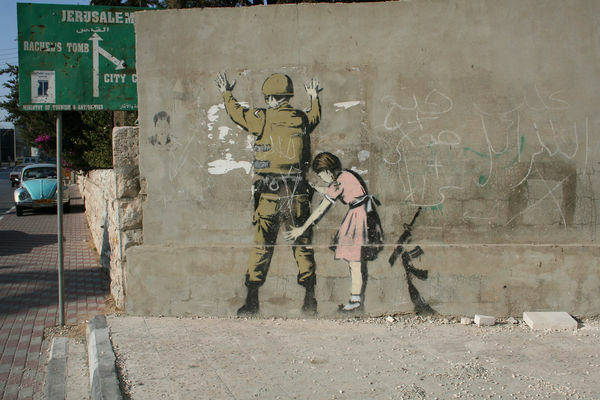 Banksy Graffiti in Bethlehem. Image not my own, found here. So said my hostess, who is both an artist and an activist. We were discussing the large amount of artists in Israel who are producing political art. Her bugbear is that artists are very quick to make political art, because it’s easy in a place like Israel, but many of them are not actually politically engaged, through protesting or such likes. I think she finds this hypocritical, or a bit of a cop-out. So it seems there are both artists and architects creating political works without actually engaging in the political situation around them. Does that make the end product any less political, though? Absolutely not, in my view. You can find something to be political even when its creator didn’t intend it, or doesn’t admit that it is…politics, like beauty, is often in the eye of the beholder.